Linda Stewart and her staff celebrate the opening of the Propel Swim Academy in South Riding. 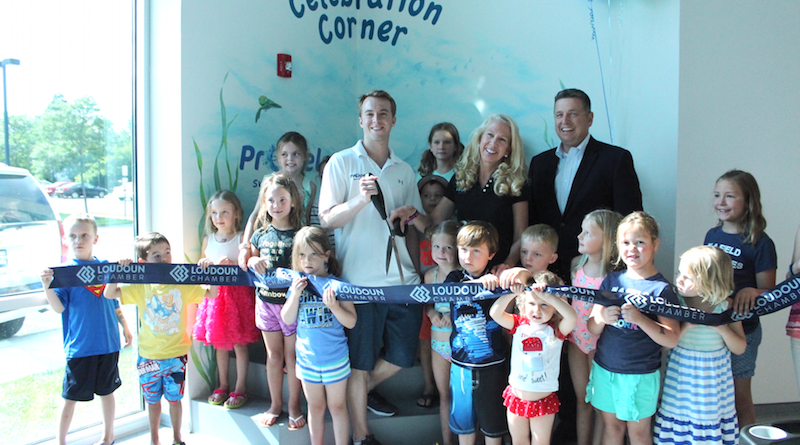 Propel Swim Academy celebrated its grand opening with a June 26 ribbon-cutting event at 43160 Amberwood Plaza in South Riding. Owner Linda Stewart has been teaching swimming lessons since she was 16 years old and holds a master’s degree in education from Virginia Tech. Stewart is passionate about teaching children to swim, water safety, and the intersection of child development and swimming and is committed to building a community of families who love to swim and who swim well together. Stewart is joined by her son, Nick, who serves as operations manager. He has a degree in accounting and previously owned a swim lesson company, Swim-2-U. Propel Swim Academy offers year-round, developmental swim lessons for swimmers of all ages and abilities from 3 months to adult. The South Riding facility has three 90-degree water pools, including a full-size 25-yard pool.